Bring together a group of faculty members from around campus for guided discussions about diversity and inclusion. Guide them to think deliberately and openly about making their classroom practices and pedagogy more inclusive. Then help them create plans to take what they had learned back to their departments and help colleagues do the same. That’s the approach behind Diversity Scholars, a program that CTE began last year with 11 participants. A second class of 10 began this fall. Funding for the program was provided by the Provost’s Office. Participants say the sessions have helped them find new types of class materials, improved discussions about social identity, and helped them challenge students to think in new ways about the intersection of course content and race, gender and ethnicity. That hasn’t always been easy, they said, but it has been encouraging, enlightening and enjoyable. Lua Yuille, associate professor of law, speaks at a Diversity Scholars session. Marta Caminero-Santangelo, right, oversees the program. Marta Caminero-Santangelo, a professor of English and a Faculty Fellow at CTE through last spring, leads Diversity Scholars. She said there had been pent-up demand for just these types of discussions, especially with tension over race, ethnicity, and gender roiling campuses across the nation. Caminero-Santangelo has been joined by Darren Canady, associate professor of English, and Shannon Portillo, associate professor of public affairs and administration, in guiding the program. 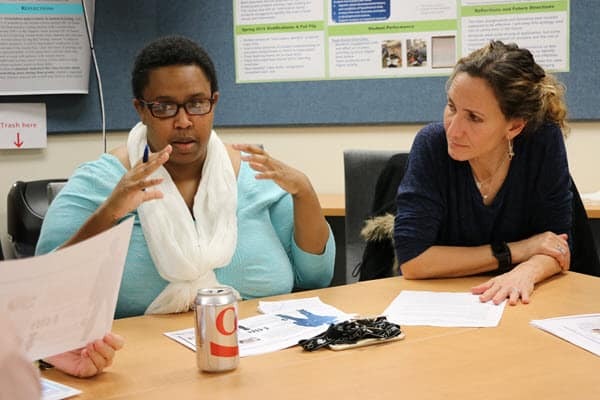 The goal of the program, Caminero-Santangelo said, is to help participants redesign a course or create a new course that more deliberately infuses diversity, equity and inclusion into the content, climate and discussions. The sessions, about one a month, focus on three areas: class content, pedagogy and class climate. The areas overlap, but they also connect with and reinforce each other. Each session involves readings, facilitated conversations and group work – essentially modeling the techniques that help students learn most effectively. The pedagogy sessions help participants understand the approaches that help all students learn effectively but that have shown to be especially effective with underrepresented groups. Those techniques include such things as clarity and transparency in expectations and grading; group work; universal design for learning; scaffolding of assignments; low-stakes assessments; and out-of-class work that frees up time for in-class problem solving and discussion. The class climate discussions flow from the other two elements, Caminero-Santangelo said. 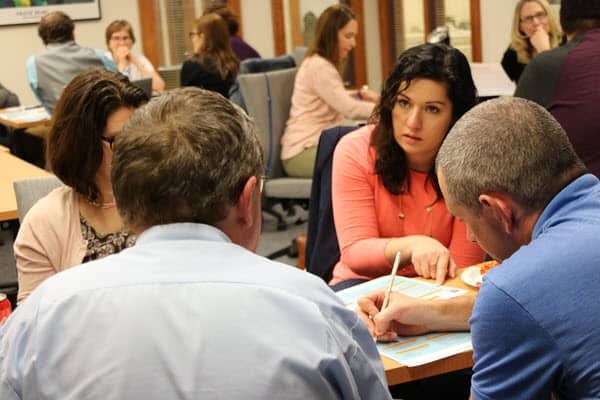 Climate also includes smaller things, she said: creating ground rules for discussion, learning your students’ names, and handling hot moments in the classroom effectively. Caminero-Santangelo said that none of the facilitators considered themselves to be experts, especially because participants came from several disciplines. Shannon Portillo works with a group during a Diversity Scholars meeting. “We had maybe a little bit more familiarity with some of the topics, but we were certainly learning as we read and found resources and then incorporated those resources,” she said. Ward Lyles, assistant professor of public affairs and administration, added readings on overcoming an us-vs.-them mentality and added two class periods on community building. He also created a syllabus evaluation checklist for faculty members. Margaret Marco, professor of music, had her recital students choose performance pieces form outside the classical canon. She added a survey to the class, asking students how likely they were to play pieces by composers from underrepresented groups. She plans to follow up with the same survey at the end of class. Tim Hossler, assistant professor of architecture and design, plans to integrate material about cultural appropriation into a required design history course. He hopes to help students think more deeply about how diversity and design culture come together. Cécile Accilien, associate professor of African and African-American studies, added more material about masculinity in her course on gender in Africa. She has had class discussions about how religion and social identity affect social justice for those in the LGBTQ community, and her students will critique an African art exhibit at the Nelson-Atkins Museum of Art in terms of masculinity. Kristof Kuczera, professor of chemistry, created a pre-class quiz on diversity in chemistry, and added an exercise in which students research and write about chemists from underrepresented groups. Participants will also share their experiences with colleagues and help them develop their own plans for being more deliberate about infusing diversity into their classes and curriculums. Caminero-Santangelo called this “a sort of spider web networking effect” that will expand the reach of the Diversity Scholars program. For those who haven’t been able to participate in a program like Diversity Scholars, Caminero-Santangelo recommended small things that can help begin a process of enlightenment. There are many resources available to help instructors make their classes more welcoming for diverse populations, improve class conversations, and help students think more deliberately about inclusivity, she said. And it’s easy to find a colleague or two and have discussions. In other words, simple actions can lead to big changes.